That's AMAZING Thomas! Can't wait to see the finished article. Thank you, but it will take some more time. But I am amazed how close I come the the real thing - or at least to what I know about it. 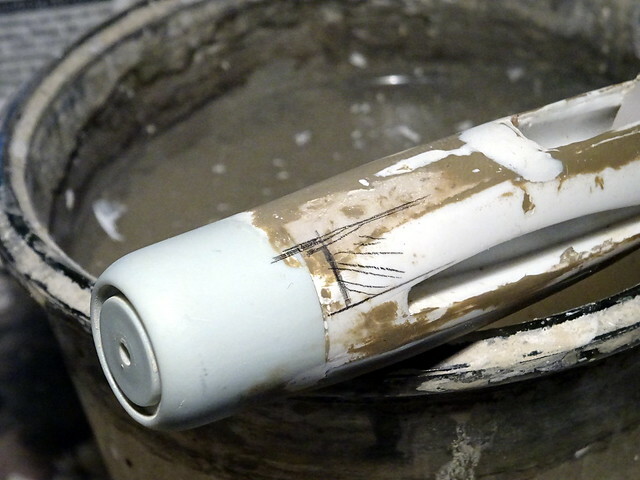 Currently integrating the F-100 front landing gear well, taken from a Tamiya/Italeri F-100D. The good thing: the kit comes with a separate well, so the implantation is rather easy since I have complete side walls, covers and the whole strut with the twin wheels. 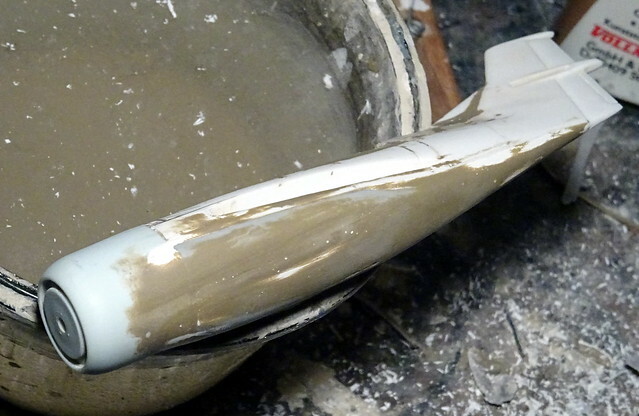 I also started work on what I think are exhaust stubs on the upper fuselage, at the wings leading edge. 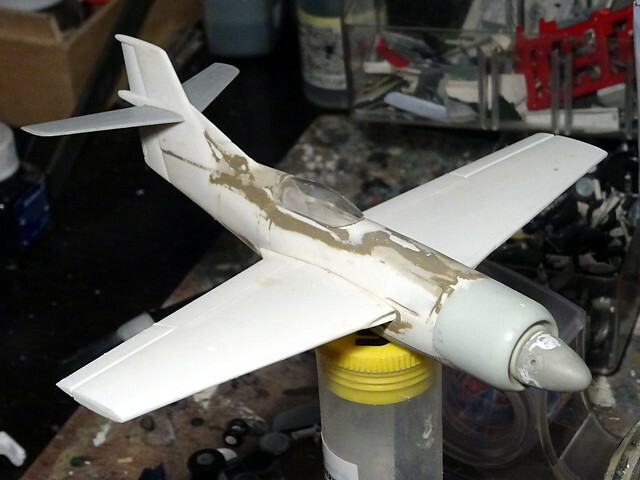 For both details I first finished the fuselage and then started cutting away material again. 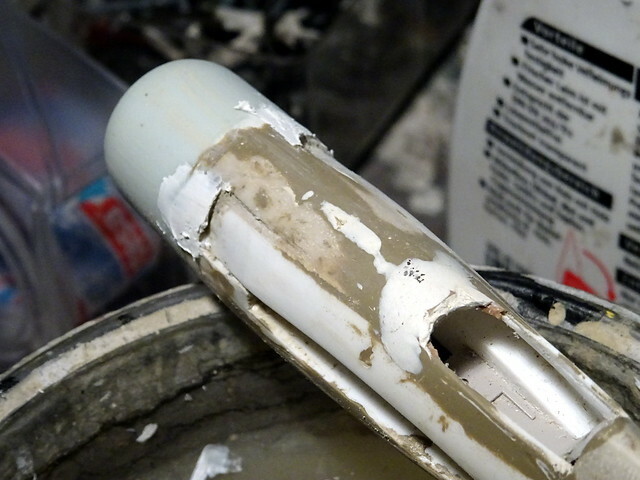 Not the most elegang method, but with so much putty and plastic involved in multipe layers, I think it's the most efficient strategy. And it seems to work - the front wheel well slipped into position like a charm, and it even appears plausible! The exhaust ports are more tricky, but thing unfold better than expected. 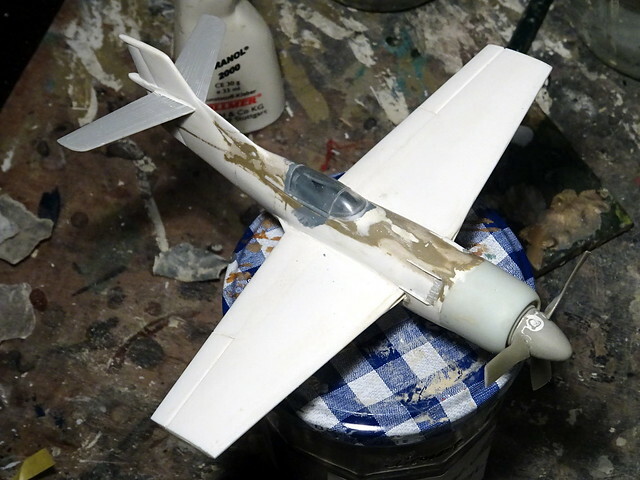 Yesterday the basic work has been completed: wings were mounted, as well as the stabilizers to the tail. The latter are supposed to come from an F-86H, "de-swepts". Since I could not find any good indication what this would have meant in real life, I went for my own solution. I found a pair of F-86A stabilizers, but found these to be too small, lacking depth. 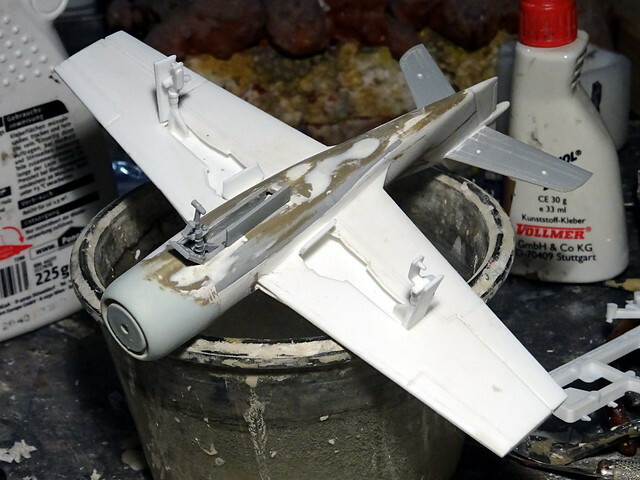 Then I tried a single F-86D stabilizer as an alternative (which has a bigger span), but it still looked goofy and much too fragile Then I tried a pair of MiG-15 stabilizers, and their shape and sweep looked much more conclusive on the T-2 tail, even though a little too small. 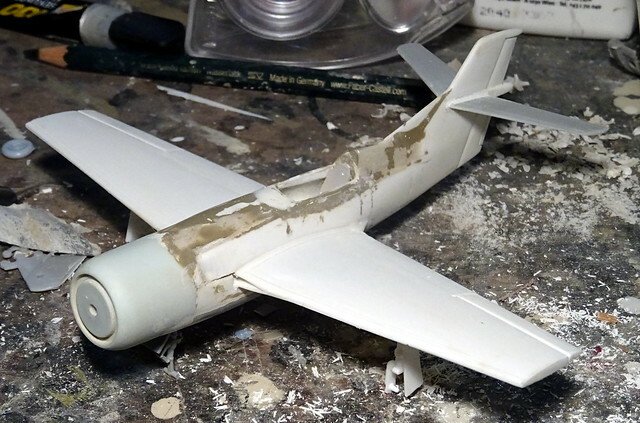 Eventually I used the wings from an 1:144 Tornado (Dragon), used the MiG-15 parts as sweep benchmark and the F-86D for the span, tailored the tips, and had a pair of suitable stabilizers for the American Spirit! I also mounted the landing gear - and it looks as weid as expected. The T-2 track is really wide (18.5' in real life), and the struts are very long, too. 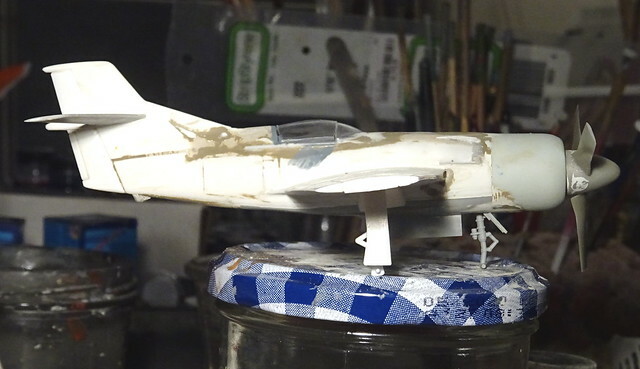 The F-100 front leg was cut down, but I kept a slight nose-up stance in order to protect the propeller. And the wheelbase is just a mere 6'!!! But this matches the description of the real design, so I must have come close to Cornell's original idea, placing the front wheel well behind the engine, under the wing roots. 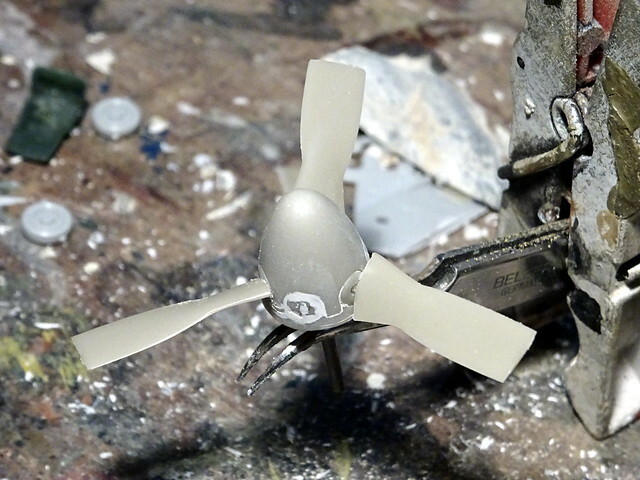 This morning I also completed the propeller, added three P-3 blades to the C-130 spinner. This looks menacing! If I may, Thomas, how about a mix of the Bicentennial and USAF Thunderbirds schemes? The Thunderbirds were also an idea - I have a decal det for an F-16 somewhere. But I favor a blue nose with stars all over, I am just not certain about the rest... I even consider an asymmetrical design. Not an easy decision. 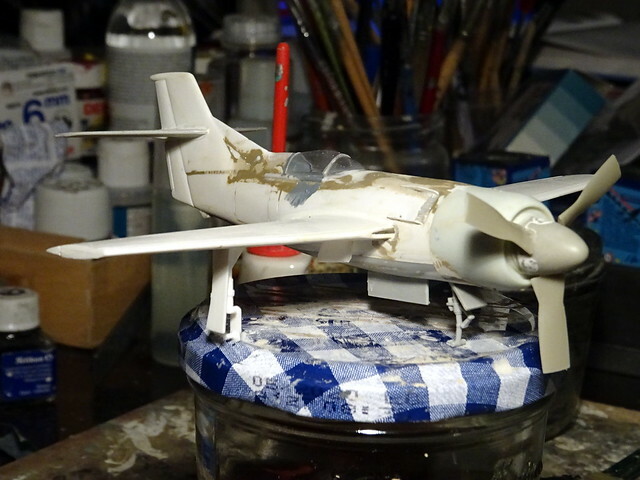 Still some detail work to do, though, and I am afraid that the white primer will have to wait until next weekend due to poor weather and light conditions outside at the moment here. aircraft centreline instead of at an angle. 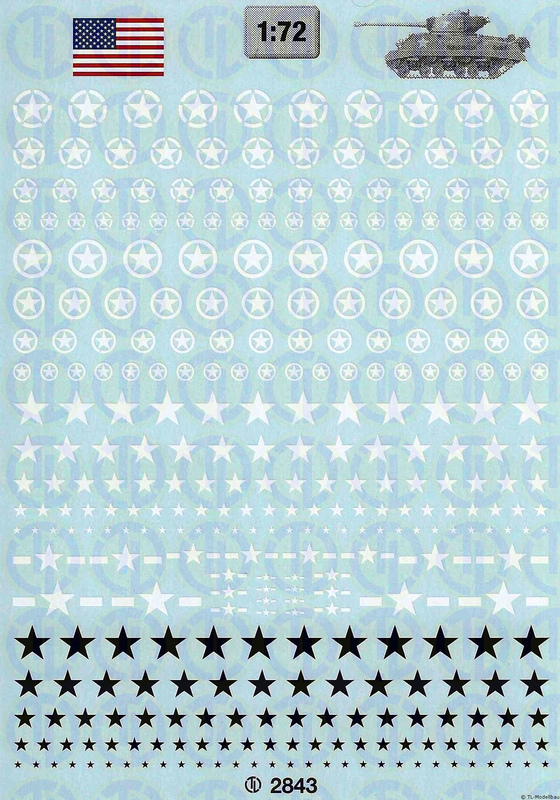 If you have or can find, the Hasegawa 1/72 F-104S NATO 50th Anniversary boxing, it has a mass of stars and such for the decals. Sadly, I just googled it, and it isn't available anywhere. Yet. I have a sheet with a zillion of WWII US Army stars from TL Modellbau. A good opportunity to use them! Progress slows down. 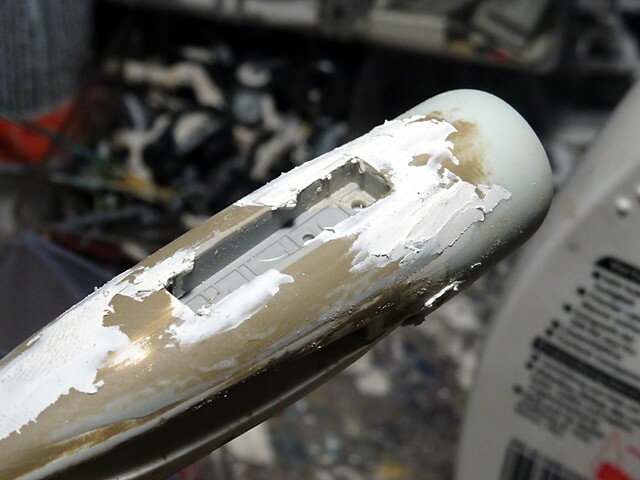 Did some detail work around the exhaust ports and the cockpit, and found some (more) minor dents on the hull. I think it was released a long time ago NH, the boxing of it in my stash has been there a long time. I was just looking at it on Sunday while I was "counting' the stash. Wow, that's looking excellent! That side view really shows off the short wheelbase, the prop ground clearance sure looks tight. What a beast! The first photo makes me think of something russian.